TTP: What you should know? Recently, Trans-Pacific Partnership Agreement (TPP) was negotiated between 12 countries in the Pacific Rim region, including US, Canada, Australia, Japan to mention a few. It took several years of secret meetings trying to establishing common framework for intellectual property, standardize labour, health and environmental laws, adjust tariffs and more. Throughout the negotiations WikiLeaks tried to make sections of the negotiated material available for public scrutiny and each section on Intellectual Property Rights seemed more worrisome then the last. Many maintained hope, that the final agreement, which each country has to ratify within their country, would not be as bad as it first appeared. Unfortunately the terms are not great for creativity, progress or online privacy. As members of broader internet freedom advocate community we would like to take a closer look at matters concerning intellectual property and copyright agreements. On Friday, July 31st, 2015, the negotiations, which started in 2013, failed to reach consensus for the nth time, but with more secret negotiations this fall – the agreement was finally reached, leaving Intellectual Property Rights agreement largely unchanged. It is important to learn what is at stake, as this and similar negotiations (i.e. TTIP involving the US and EU) are ongoing. The TTP has received a lot of criticism for the level of secrecy surrounding the negotiations. Bernie Sanders, an independent representing Vermont in the U.S. Senate, said earlier this year “It is incomprehensible to me that the leaders of major corporate interests are actively involved in the writing of the TPP, while the elected officials of this country have little or no knowledge as to what is in it,” Nevertheless, Wikileaks continuously managed to publish leaked documents (even offered a reward for additional leaked info) garnering further critique from content of draft proposals. Back in May WikiLeaks published the draft Intellectual Property Rights Chapter. The intellectual property section of the TPP agreement sets standards across all co-signing countries enforcing and setting guidelines to trademark an copyright rules. Changing the copyright terms and regulations. Proposed extension of copyright to 70 years after authors death and making it a standard among all TPP countries. Potentially making it 130+ years protection (authors life plus 70 years). Significance Imagine if 70 year copyright law existed to date and certain long forgotten works were analog – they literally could have dissolved, because no one could have transcribed a copy in digital form. The reason the internet is a fundamental part of our daily lives is because of access to information. Barriers to information would hinder peoples’ abilities to innovate. In some countries it can cause stagnant culture effect. Accessibility issues. Internet users with disabilities face tremendous challenges to access information. There are special tools, like closed-captioning embedded in the digital files, however they are often locked within Digital Rights Management (DRM) control techniques set to protect copyright content and devices. 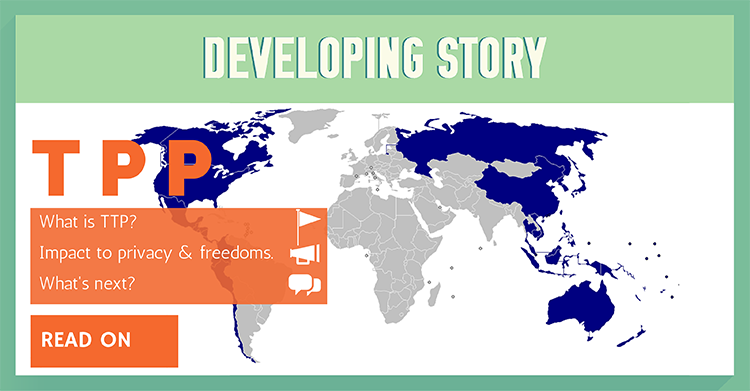 TPP would adopt use of DRM across all countries. Significance TPP would render any tinkering to adjust files within DRM illegal and would extend this provision to other vested countries. If someone with a disability wants to circumvent DRM, they either have to do it themselves or use illegally obtained tools to do so. Digital content locks. Circumventing any digital content rights protections like DRM would be illegal. Essentially US will push for adoption of the US Digital Millennium Copyright Act (DMCA) to all signatory countries, thus entrenching it back home. Significance DMCA also criminalises the act of circumventing an access control, whether or not there is actual infringement of copyright itself (i.e file sharing), yet protect service providers from monetary liability based on the allegedly infringing activities of third parties. Limitations to freedom of speech/increased threat to journalists and whistleblowers. The vague language surrounding the ‘misuse of trade secrets’ section could limit free expression and compromise journalistic work. Significance Journalists have always championed the freedom of speech, exposed certain sensitive stories, selflessly hoping to improve the world we live in. Implications could be dire in some countries that fail to have other flexibilities and/or exceptions protecting freedom of speech. Uniform punishment standards. Users could be jailed or hit with exorbitant fines over file sharing, and may have their property or domains seized even without a formal complaint from the copyright holder. Significance The entertainment companies had a chance to further their agenda by heavily lobbying / presenting to negotiating ministers. If TTP was adopted it would been a win only to big companies, ignoring possible side effects to the culture, while lawmakers would have their hands tied. Internet service providers could be made responsible for enforcing intellectual property rights and this would likely lead to more internet censorship so that copyrights were not breached. Why did TTP fail to go through earlier? Some countries opposed various sections of The intellectual property section of the TPP agreement. For instance Australia did not support the US proposal to “limit the liability of ISPs for copyright infringement by users. Japan was worried about protecting the self published creative work culture (manga industry). Reportedly, Canada opposed the section 59 more times than any other country – with strongest opinion in the patents, enforcement, trademarks, and copyright sections. However, the vow by the current US administration to finish the trade negotiations that started back in 2013 seems to have been the driving force to push through the agreement asap. US even introduced a fast track legislation called “the Bipartisan Congressional Trade Priorities and Accountability Act of 2015” (known as TPA). It was passed by the senate on June 24th, 2015 and signed by the president becoming a law on June 29th. This means TPP policy will be here soon across 12 Countries in the Pacific Rim. Intellectual property rights clause of TPP agreement raises significant concerns for internet’s infrastructure worldwide, as significant changes are coming to 12 influential counties. Individual rights for citizens including freedoms of expression, innovation and creativity, as well as due process are also at risk. Inability for each country to take a sovereign decision in policy making and custom lawmaking that reflect different cultural priorities is also a grim prospect for the future of knowledge for the world citizens. If you are in one of the TPP countries reach out to your local policy makers and express your concerns on the topic. If the laws are ratified – encrypt! Further: The leading internet privacy and security experts at EFF ( Electronic Frontier Foundation) continuously organise efforts to educate on this topic. Follow the development of this issue and learn how to take action HERE. Vote in the BestVPN.com Awards and win a free NordVPN subscription!